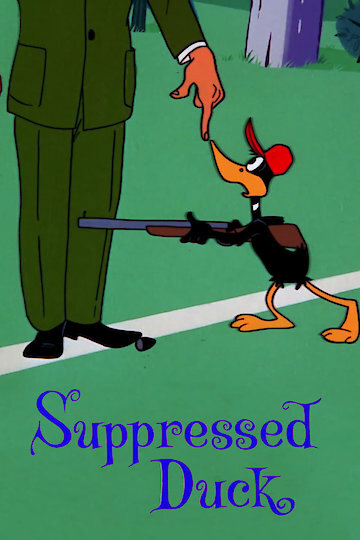 Suppressed Duck is a 1965 Looney Tunes film featuring Daffy Duck. The story is about Daffy going on a bear hunting adventure. He happens to see an announcement describing rules and regulations for the hunting area. A boundary line demarcates the hunting area from the non-hunting area. Bears are safe as long as they do not cross the line. Daffy concocts a number of schemes to trick the bears and make them cross the line. One scheme involves disguising himself as a tree. Needless to say the bears always outwit the flabbergasted Daffy. This is a fun cartoon movie for all ages.